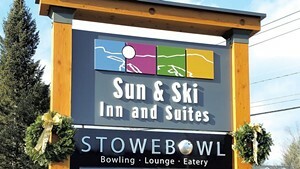 The Sun & Ski Inn and Suites hotel in Stowe opened its much-anticipated bowling alley, Stowe Bowl, this week. The eight-lane venue has its own entrance next to the hotel's. 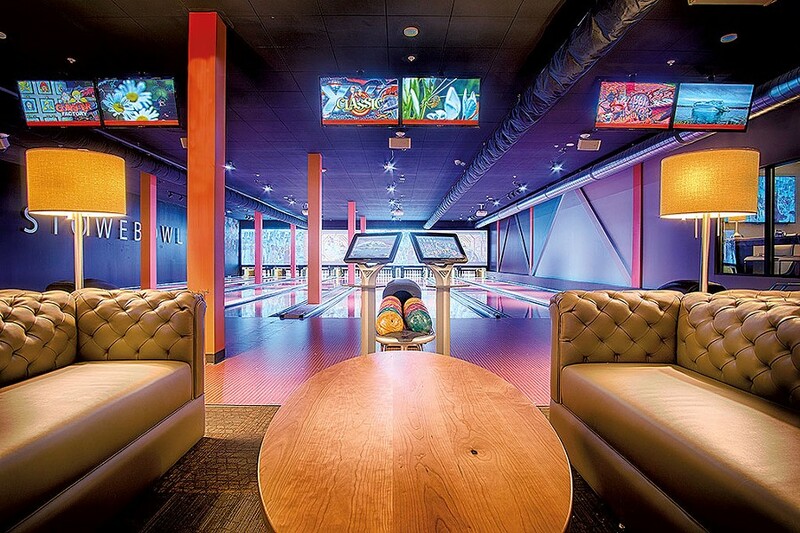 When co-owners Mark and Rachel Vandenberg renovated in 2015, they decided that besides expanding from 15 rooms to 39, they wanted to provide an indoor recreation option for both locals and hotel guests. Rachel had a specific vision in mind: "We wanted something midcentury modern, sort of like 'Mad Men.'" The space has retro-style couches and wooden coffee tables created by Karl Fjeld of High Pond Woodworks. "What we ended up with is beyond our expectations," she says. The menu diverges from typical bowling-alley fare, too: "We really want to provide quality food," Rachel says. Patrons can either order and share small plates — such as Asiago-truffle popcorn or a Vermont cheese and sausage board — or go for something more substantial to eat on their own, such as a burger or flatbread. Stowe Bowl has nine draft beers, mostly locals like Switchback Brewing's Switchback Ale and von Trapp Brewing's Golden Helles Lager. Cans offer a wider variety: "You can find everything from Heady Topper to Bud Light," Rachel says. The Vandenbergs expect to open Stowe Bowl to the public on Wednesday, February 3. The original print version of this article was headlined "Memory Lanes"